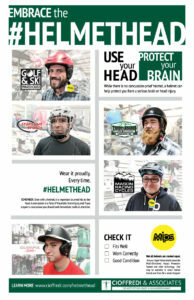 #HelmetHead FIT YOUR HELMET from Cioffredi on Vimeo. Concussion Management is an important topic in the field of sports medicine, and we are pleased to offer treatment for this condition. Ensuring full recovery of the brain before return to sport or activity is critical. If athletes return to play before the brain has had a chance to fully recover, a less intense blow or hit could cause the same if not more damage to brain tissue, with longer more intense impact on their life. A concussion is a mild form of traumatic brain injury that generally resolves quickly. It is caused by a blow or bump to the head or body. It’s important to note that it doesn’t always have to be a major collision for a concussion to occur, nor does it always come with a loss of consciousness. If you suspect a concussion, you should seek immediate medical attention. Rehab for concussion is managed in a very specific sequence, allowing time for the brain to fully recover. If not properly managed, you can experience post-concussive symptoms for months, limiting your ability to concentrate, read, or even watch TV. Initial focus of rehab is on relieving symptoms of dizziness, headache, loss of balance and coordination. Once these symptoms are gone, a strict return to activity protocol is followed. If at any point in the protocol the person’s symptoms return, this is a sign that their brain is not ready, and we need to modify the progression. Both the State of New Hampshire and the State of Vermont require sign off by a qualified healthcare professional to return to sport, and this is something that we are able to provide after the rehab process is complete. Kevin Pearce delivers a compelling TEDx talk on brain injury. Learn about Multi-Directional Impact Protection System (MIPS) technology, a feature of many high-quality helmets. MIPS – Helmet Protection System from Pictionary Productions on Vimeo. Learn about the POC SPIN helmet padding technology.